I put finger to keyboard tentatively, rather wishing I had one of those bamboo laptops. Not that I am superstitious or anything, but something nice just happened and touching wood reassures. A short while ago my Volvo V40 bi-fuel developed a problem with its LPG operation that our local garage could not handle. Hence I brought it to our nearest dealer, in Hereford. They kindly provided a courtesy car and kept it for investigation. After a fair amount of time they got in touch to say that they had worked their way through the system and had already near reached the £200 mark without success (I foolishly had not specified that such amounts to see what was up were not favoured), and with no guarantees on a solution being found, I was looking at a very expensive component being sourced they could not easily locate, plus a major job swapping it in. Hence I agreed with them on disconnecting the LPG for safety, even this meant lugging around a 40kg (they had asked for it to be filled) LPG tank despite future petrol operation, as there was no venting facility (fun fact... LPG has to be at a very precise mixture in air to be explosive, so a leak in the open is unlikely to be as serious as may be feared). Upon picking up the car, after a few miles smoke started pouring from the bonnet. Rather foolishly (despite the above fun fact, LPG is not something to mess with) I drove it straight back. The staff present were very defensive, claiming all sorts of nonsense. I was in particular unimpressed that, after a £200 engine investigation they tried a) to claim that the leak was possibly coincidental and b) had in fact been noted. Just... no one had evidently thought to mention it to me or on the invoice/advice. Plain silly to try such a tack. Following a conversation with the manager by phone I was at least provided with the courtesy car again and left it with them. I was called some further days later by the manager who, to his credit, conceded that the smoke was not from a leak at all, but due a a cap blowing off pressure testing, resulting in oil spraying on the hot engine. They had cleaned and checked and deemed all well. However, I was now lumbered with a mono-fuel car. Enter, thanks to Kathy, lovely PR for Autogas, Hilton owner Billy and LPG guru to the stars, Arthur. In less than 3 hrs these guys reconnected the system (comprehensively unconnected by the dealer), ran diagnostics, identified problems, replaced parts and serviced other key areas that had, until that point, still been left unaddressed/serviced. Including one component most likely responsible for or contributing to the running issues that were the initial problem. Not the one guessed at with such a vast proposed cost, I might add. Specifically, look at the components above. The one at the bottom is what was removed. It seems to be a bodge, welding two parts together. This was what was in the governor (also possibly called regulator). It was either in there when brought to the main dealer, or introduced by them. In any event, it remained unremarked. The one above is what should have been in there, and now is. That the car runs perfectly now suggests it was a wise thing to replace, and did not require a £multi-hundred governor to be replaced as well, as suggested in their invoice. So, for the price of Volvo taking days to tell me nothing could be done and almost setting fire to my car, these guys took but a few hours to fix and improve. I am now under no illusions that bi-fuel was an experiment by Volvo (as with the other major brand dabblers) and dropped very quickly as a unprofitable job (this model was not even registered with TFL for the congestion charge exemption). I bought that car as factory-fitted to avoid any such concerns, trusting the brand would live up to its commitment to reliability and eco (that I support thanks to green beliefs). Not to have hands washed as it's all 'rare' and unusual and too hard. Volvo evidently dropped LPG years ago as a priority, and despite a responsibility and duty of care has not admitted it, failing to train, or ensure the authorised service centres are aware of the systems and how to service/repair them. No one has been honest enough to admit this, preferring instead to try a stab at addressing maintenance or problems, but actually making stuff worse, adding the insult of huge fees to the injury of failed, dangerous work and clearly inaccurate advice. It is my view (expressed now to Volvo head office) that if you cannot handle your own manufactured product any more, at least have the decency to locate and recommend those who still can. There are folk out there who do know what they are doing. They should be sought after, treasured, and highlighted as I do here. What was as amazing as the repair, was that I was welcomed as an observer throughout, and learned a lot in the process. Unlike our EU cousins, LPG is treated rather differently here. It is a sensitive fuel, comprising a mix of butane and propane. With temperature, this mix can offer markedly different results on performance. Hence, before getting into our tanks, on the continent the blend is tuned to optimise the result. Oh, and the 'quality' of UK LPG is a lot lower too. Sadly, the price difference and range from a 40l tank doesn't make a Calais top up trip worth it. ps. On matters fuel storage, LPG is good to go for long periods. That 4* in the Jerry can in the garage for the next tanker strike?... little better than last week's milk. Best to only use in the lawnmower. pps: Never be tempted by cheaper gas options. 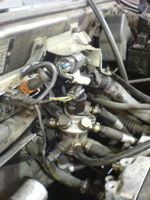 Arthur showed me the guts of a unit where the 'saving' on fuel was rather offset by the need for a new unit. LPG is a fickle beast. You need to get from a high pressure liquid in the tank to a precise pressure gas/air mix in the same pots as fire up on petrol. That takes some kit. Kit with moving parts, and ports, injectors, etc. These need to be tuned to perfection and clean. The top unit pictured above is the distributor. It has a piston that moves up and down, with V shaped apertures vertically along the barrel. The piston moves and you get more or less gap, and hence fuel. The edges can fur up. So they need cleaning. The good news is that, at 8k a year, this can be stretched to 2 years. I'd guess that may be pushing it to ensure optimal performance. 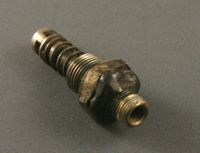 Finally, beyond all the filters, etc needing to be clear, there are the spark plugs. Again, any old plug will not do. Different fuel, different demands. And LPG needs a perky spark. Hilton recommend NGK LaserLines. Not cheap, but false economies catch up with you. Looking to find, and figure out how to fit. I am now poorer, but a lot wiser, though richer in knowledge. Especially about LPG as a fuel and source or vehicle power. Plus I have a car deemed at one point worth £750 as a favour, but now a still perfect, 5-door estate with 75p/l fuel. Good for several more years, he hopes, holding the table top. Part of an LPG system is the regulator. These are usually rated at 80,000 miles. And around £400+ fitting to replace. So, worth bearing in mind if buying 2nd hand. If not totally messed up (a diaphragm degrades and affects performance) they can be 'helped' by some behaviour changes. These can also help with cars, such as Volvos, where the auto switch-over on start up from petrol to LPG, rigged too early to meet emissions demands, can mean that the chamber is not warm enough to pre-heat the gas and causes misfires. Hence the trick is to start with the LPG disabled and only switch on once the engine has warmed after a few miles. So far... it has solved the problem.